For industrial users and the hobby builder who appreciates pro-grade equipment, CNC Router Parts is proud to introduce our new Nema 34 DIY kit. This kit features top-grade components suitable for heavy machines, high-speed rapids, and deep cuts. Individual 7A rated Gecko drives are matched perfectly to our 7A motors, and our cabling solution makes for a polished and rugged connection system. The kit features the following. 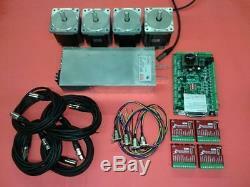 4 960 oz-in Nema 34 motors for X and Y, and Z axes. 4 Gecko G201x Motor Drivers. 4 7A rated shielded motor cables (two 20' and two 12' cables). 4 bulkhead connectors to mount in your own electrical enclosure. Note, this kit does take more wiring than a G540 based solution. These take longer to produce (and cost more as well), but are available for those uncomfortable with the electronics side of CNC. Note: Additional cable and drive options are available for this kit. The item "4-Axis DIY Nema 34 Kit (for CNC Router / Mill)" is in sale since Wednesday, June 13, 2012. This item is in the category "Business & Industrial\Automation, Motors & Drives\Other Automation Equipment". The seller is "cncrouterparts" and is located in North Bend, Washington. This item can be shipped worldwide.